Pittock Mansion is now offering $5 admission to low-income Oregonians! Simply show your Oregon Trail Card to purchase discounted tickets. This offer is made in partnership with Arts For All, a collation of organizations offering discounted cultural experiences to food stamps (SNAP) recipients. 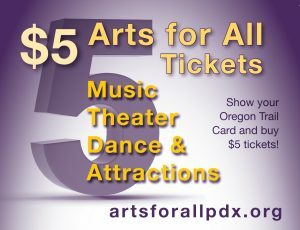 Learn more and find a list of participating organizations on the Arts for All website.